1. Preheat the oven to 190˚C, gas mark 5. Line a large baking tray with baking parchment. Toss the carrots with 1 tbsp oil, season and space out well on the lined tray. Roast for 55 minutes, until browned and just tender. 2. When slightly cooled, roughly chop the carrots and add to the bowl of a food processor (set aside the lined baking tray for later). Pulse until it becomes a finely chopped, but not quite smooth, purée. Tip into a mixing bowl and stir in the breadcrumbs, garlic, coriander and ground spices; season. Mix in the egg then, with clean hands, shape into 4 firm burger-shaped patties. If you have time, space out on a plate and chill for 15 minutes to firm up a little. 3. Using a sheet of kitchen paper, mop up any excess oil from the baking parchment, then space the patties out on the lined tray. Brush with the remaining 1½ tbsp oil and bake for 25 minutes, until turning golden. Warm the halved brioche buns in the oven for the last 3 minutes of cooking time. 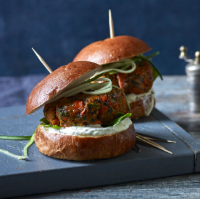 Spread the base of each bun with tzatziki and arrange some torn lettuce on top, then add the burger and finish each with a few cucumber ribbons and the bun tops.